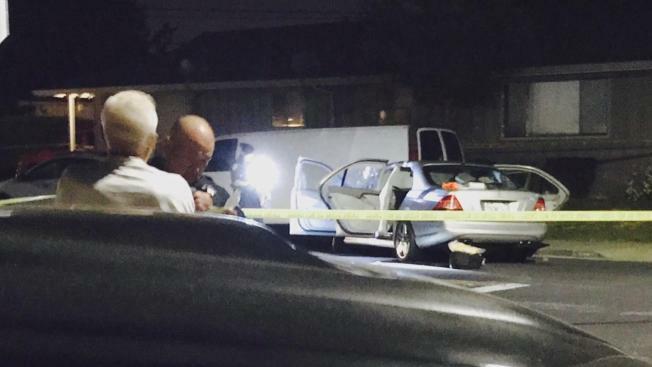 A 17-year-old boy from San Jose was gravely wounded in a shooting Wednesday night in Santa Clara, according to police. At 10:44 p.m., a Santa Clara police officer was parked when he heard what he thought were fireworks going off in the area of Brookdale and Bing drives, police said. The officer drove to the area and discovered a vehicle had crashed into a parked car, and the driver, the 17-year-old boy, was suffering from a gunshot wound. The teen was taken to a hospital, where he was in grave condition as of noon Thursday, police said. Neighbors said they heard several pops in the street and figured people were still celebrating a day after the Fourth of July. "So we just heard the fire, the shooting, gun shooting," resident Garima Khandelwal said. "We thought it was fireworks." The silver Mercedes crashed into the back of Sang Shin’s white cargo van. The teenage driver still had his foot on the gas pedal. Shin said the tires burned two holes in the pavement. "All this noise, I come out, too much of the smoke," Shin said. Another resident, who didn’t want to be identified, said police officers got there fast. "Shortly after the police came on the scene they started their investigation, and within an hour or so they found shell casings and marked off the whole street," the neighbor said. Officers searched the area for a suspect but did not find anyone and have not made any arrests in the case. "Even the smallest amount of information, pieced together with other pieces of information, could become very useful to us," said Santa Clara police Capt. Wahid Kazem. Anyone with information about the shooting is encouraged to call Detective Sgt. Saskia Lagergren at (408) 615-4823.